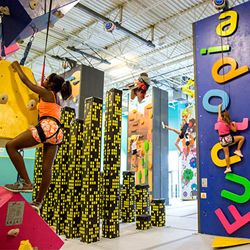 This Funtopia coupon allows you to Buy a 1 hour pass at both Funtopia Naperville or Glenview locations and receive 1 hour FREE within the same session. Print and present coupon at time of purchase to receive your discount. Funtopia is a unique concept that combines sports and fun. 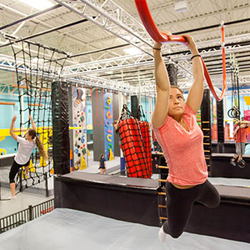 Our Active Entertainment Centers in both Naperville and Glenview offers adventurous, entertaining and healthy activities for all ages, all under one roof. With so many Fun Walls, a Rope Course, a Ninja Course, a Giant Slide a toddler area, there is something for everybody age 1 to 101. Our main goal is to get people involved in challenges that will make them have a good time and provide excellent health benefits at the same time. That’s why all our attractions are specifically designed to be entertaining and good for the mind and the body. Funtopia has everything to make your birthday party the best ever: tons of fun activities, interactive attractions that can be enjoyed and shared by all the guests, awesomely decorated private rooms and a spacious common lounge, pizza and much more! View Coupon Details Coupon is valid at both Naperville and Glenview locations. Buy a 1 hour pass at both Funtopia Naperville or Glenview locations and receive 1 hour FREE within the same session. To redeem click view coupon details. Print and present coupon at time of purchase to receive your discount. Click the location below to visit their website for more information or to book your party today! Westridge Court – on Route 59 where E. New York Street and Aurora Avenue meet.